The Transformers franchise is one that had run its course and the last few outings were, to be frank, god-awful and worse, terribly long to boot. So when Bumblebee was announced, I really had no interest and despite some decent trailers, and that it starred Hailee Steinfeld and John Cena, my interest level was still at a minimum. But with some solid reviews amongst professional critics (93% on Rotten Tomatoes, 6.99/10 avg. rating) and high marks with the audience (3.9/5 on RT, 7/10 on IMDb), I did have some hope for this spin-off, though not enough to see it in theaters. And I can safely say, Bumblebee was a wonderfully sweet and fun little big movie. It doesn’t quite restore any faith Transformers is on safe footing even without Michael Bay (who was a producer) at the helm, but as it is, there was a lot to admire. The story opens up on Cybertron in a visual effects “spectacular” that looked more like a video game than anything remotely live action (no real surprise, it is a CGI environment with CGI robots fighting other CGI robots) and with the Autobots losing ground against the Decepticons, Cybertron has fallen and Autobot leader Optimus Prime (once again voiced by PETER CULLEN) sends off his soldiers to disperse across the universe, including his right-hand… robot, B-127 (voiced by DYLAN O’BRIEN), sent off to Earth with Decepticon Blitzwing. 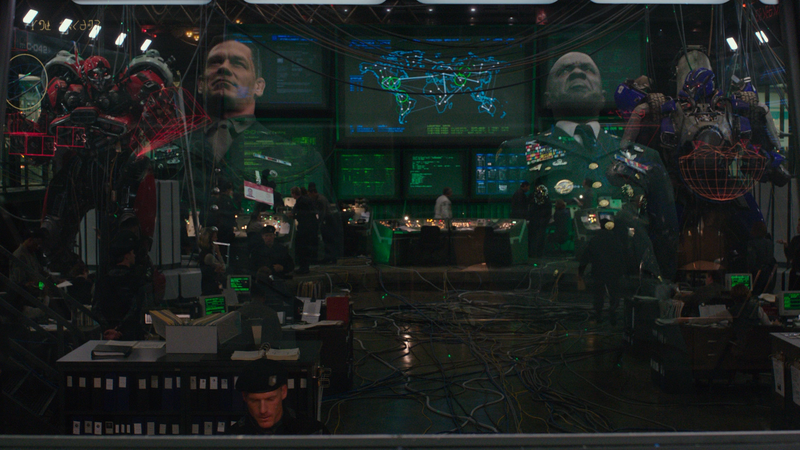 In the middle of their entry to Earth are government agents on an exercise, including Colonel Jack Burns (JOHN CENA), who immediately presumes B-127 to be an enemy. Following a rough-and-tumble between B-127 and Blitzwing, for which he tore out B’s vocal components and ruins the memory core, ultimately Blitzwing is defeated, B-127 is critically damages though before shutting down, scans an old Volkswagen Beetle. It was almost like fate when 18-year-old Charlie (HAILEE STEINFELD), still reeling from the death of her father, comes upon the VW Beetle at an old junk supply yard, which the owner gives to her as a birthday present. Upon taking it home and examining it, B-127 comes to life and after the initial shock, the two begin to form a bond, though with no memories and unable to speak, she bestows to him the name of Bumblebee. Meanwhile, Decepticons Shatter (ANGELA BASSETT) and Dropkick (JUSTIN THEROUX) have tracked Bumblebee to Earth and needing the satellites to locate him, strike a deal with the U.S. government for access and in exchange the government would receive advanced technology. However, Burns does make the keen observation that perhaps with a race called Decepticons, maybe they shouldn’t be trusted… Of course, doesn’t take a genius to figure that out, although in fairness, once the Decepticons outlast their usefulness, the military wants them taken out. Plot wise, there’s not much to the movie with Shatter and Dropkick, discovering Optimus is on his way to Earth, need to get a signal out to other Decepticons which would start a war on our planet… Which of course will happen in about 30 years from when this movie is set. 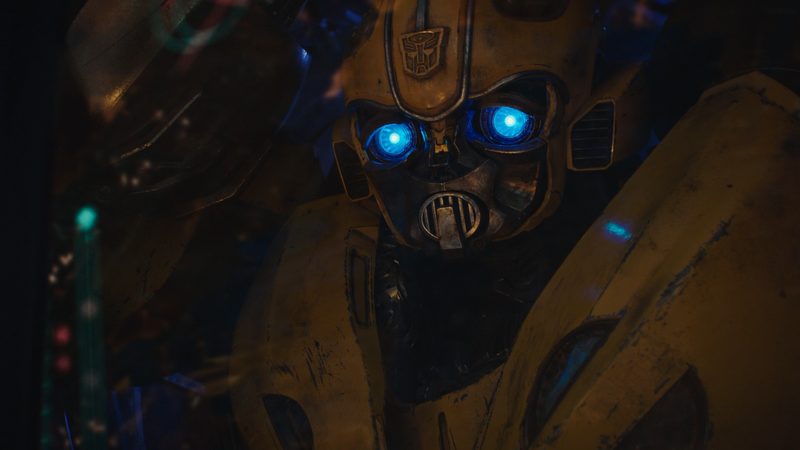 However, where the film shines, and where the previous Transformers failed, miserably most of the time, is this character-driven and has some genuine heart, with the relationship between Charlie and dealing with her father’s death and the healing that Bumblebee helps, as she gives aid to somebody lost. There are quite a few touching moments, but still enough room to give the robot vs. robot and explosions people crave from their blockbuster films. The performances from Hailee Steinfeld is wonderful and her interaction with what was just a CGI animation was fairly believable. Also deserving some honors is Jorge Lendeborg Jr. as the quasi-love interest (mostly on his part at first) while John Cena’s character doesn’t really get much development, just a military dude doing his job, but at least isn’t the complete human a-hole. 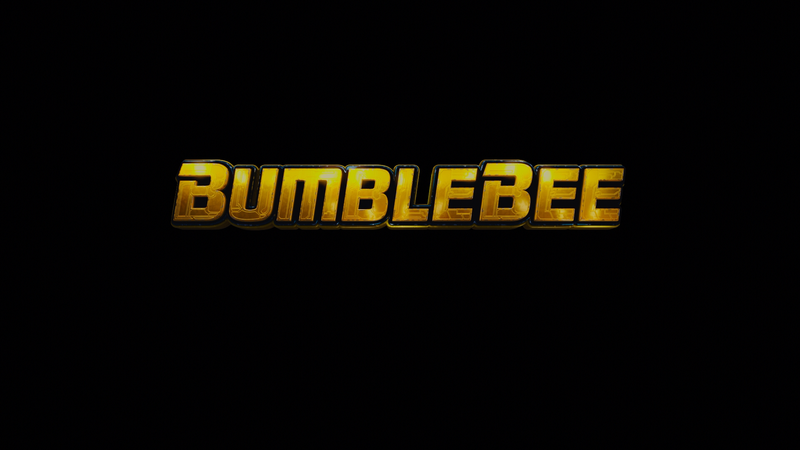 With a screenplay from Christina Hodson, better known as the person behind such classics as Unforgettable and Shut In (does have Birds of Prey coming up next year), Bumblebee was directed by Travis Knight marking only his second feature-length film following Kubo and the Two Strings animated movie, though Knight seemed like a good fit with his background in animation. This release comes with a glossy, title-embossed, slip cover. Tucked inside is a mini-comic book. Inside the case is a redemption code for the Digital HD copy. 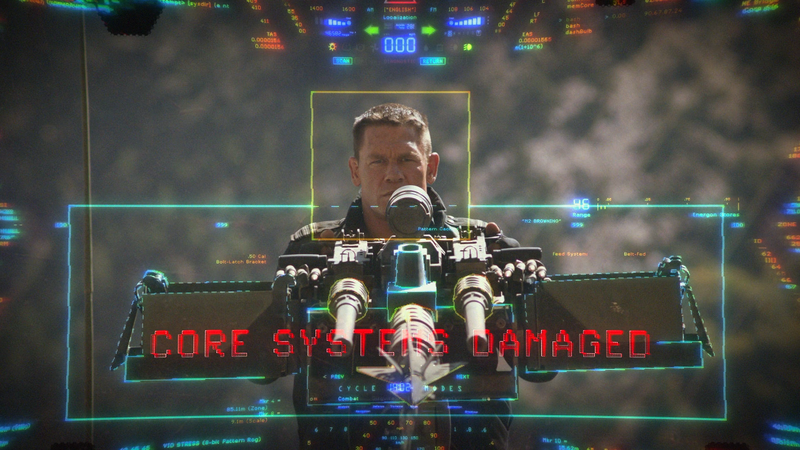 Agent Burns: Welcome to Sector 7 (0:50) is an in-character intro from Cena. Sector 7 Adventures: The Battle at Half Dome (9:19) – This is an animated comic. Deleted and Extended Scenes (19:05) – There are nine scenes either trimmed or cut including the original opening (which thankfully they didn’t use). Nothing exactly noteworthy but worth watching some alternate scenes. Outtakes (9:32) filled with shenanigans, mostly by Cena. Bee Vision: The Transformers Robots of Cybertron (3:56) is a short breakdown on the robots featured in the opening sequence. Bringing Bumblebee to the Big Screen (TRT 47:17) is split into 5 parts including ‘The Story of Bumblebee’, ‘The Stars Align’, ‘Bumblebee Goes Back to G1’, ‘Back to the Beetle’ and ‘California Cruusin’ Down Memory Lane’. Each one delves into the story, characters, casting, taking inspiration from the 1980s Transformers cartoons, and more. 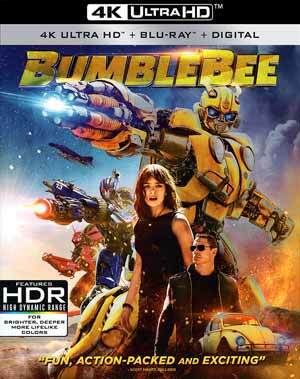 Paramount releases Bumblebee onto 4K Ultra HD and Blu-ray presented with an open matted 1.78 widescreen aspect ratio (released in theaters at 1.85) and given 2160p and 1080p high-definition transfers respectively. The picture here does look gorgeous with the bright colors, aided by the HDR on the 4K disc (Dolby Vision also available for those with the equipment) while detail was still sharp and well defined throughout. Still present is the natural film noise giving the picture an authentic appearance. If there was one thing consistent with the Transformers franchise it’s with the immersive audio and this Dolby Atmos track sounds incredible, and thankfully it is available on both the 4K UHD and Blu-ray discs. There are enough quieter, more dialogue driven scenes that contrasts well with the action extravaganza, each one making nice usage of the channels and for that extra kick, the LFE turns on where, during the action scenes, you feel the bass go through your bones, it’s that incredible. Like the others in this series, this is reference quality work. 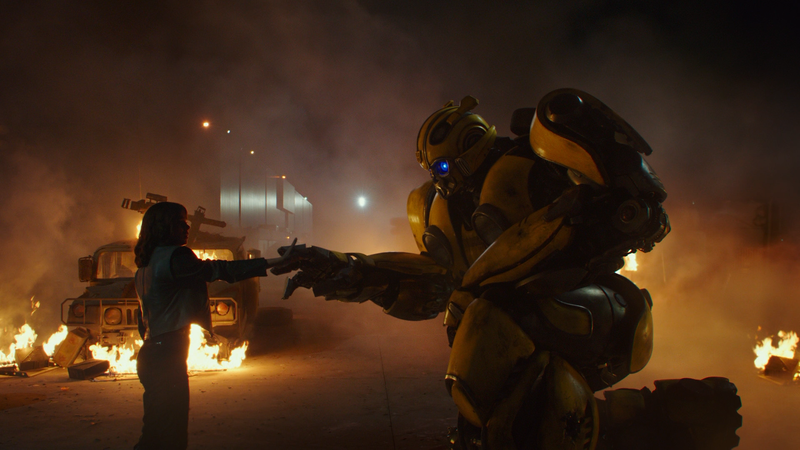 Overall, Bumblebee was a pleasant surprise with a genuine heart at its core, the relationship between a robot and a girl, each one finding the other at the right time. It’s what was missing from the last several of the Transformers movies, mostly replaced with poor humor and little character development. This 4K UHD/Blu-ray combo pack includes a decent selection of bonus features and incredible video and audio transfers.